I realize I'm beginning to sound like a broken record, but a single week will never be long enough to do a UK town justice. However, given we had one final day in Whitby we were determined to hit the beach. See those buildings to John's right on the top of the West Cliff? That's our destination, but first we wanted to take full advantage of the expansive beach and enjoy the sunshine. We even saw a rainbow. While the Abbey has its 199 steps, the beach has meandering walkways and staircases that provide access to the West Cliff. It's quite a climb, but the view from the top is SO worth it. Many of the homes are vacation rentals. Maybe on our next visit we'll look into a flat with a sea view! Anyway, we walked until our stomachs began to grumble, and then turned around and headed toward the centre of town. 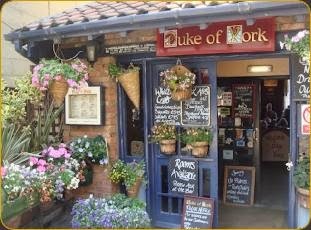 John suggested we cross the Esk River into Old Town and go to a little pub we'd spotted earlier called the Duke of York. 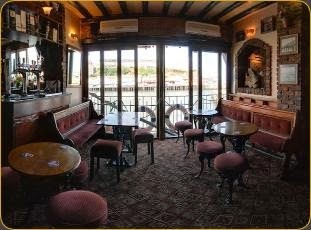 If you click the link to the pub it provides a great snapshot of where exactly it is located on the Esk. Both photos are courtesy of the Duke of York website. Being lunch time it was crowded, but we were fortunate to get the table on the left beside the bar. John ordered Seafood Chowder while I had Whitby Scampi. Both were delicious, as was the accompanying Guinness. And the view from our table was pretty awesome, too! A great day in a lovely town. Whitby truly stole my heart!